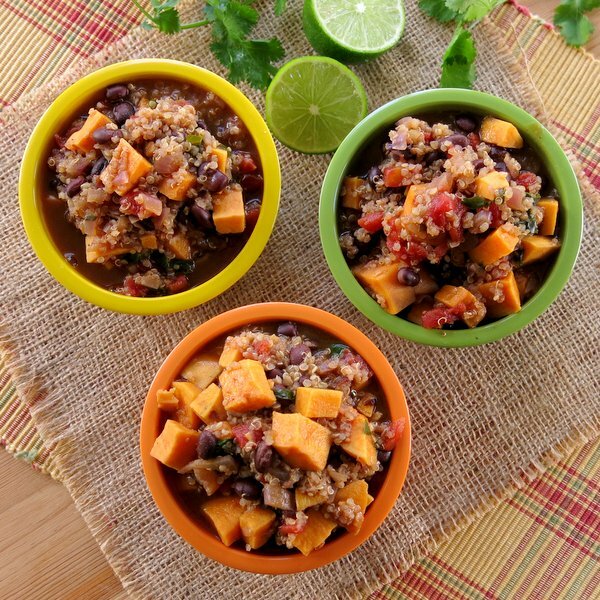 Sweet Potato Black Bean Chili with Quinoa is a hearty, vegetarian recipe that will even satisfy the carnivores in your house. I think the quinoa gives it a little something extra and gives it a chili feel. And, adding this little seed is so easy to do. Just add it along with the other ingredients it will cook while the chili simmers! I love this process so much we added quinoa to Black Bean Quinoa Soup and our homemade vegetable soup recipes. First, I found that the 4th Thursday of February is National Chili Day, which just happens to be February 25 this year! Of course, this is not a public holiday. But, you will find lots of great chili recipes out on social media. But, what I really wanted to know was whether I could indeed call this recipe “chili” when in fact there was no meat involved. It turns out the great debate is about whether or not chili should contain beans. 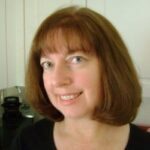 It’s a regional issue according to Beans in Chili by the Huffington Post. Meat is a given. Sooooo…..add add some crumbled ground beef or turkey to this recipe if that’s how you roll. Beans, no beans. Meat, no meat. In my book, so long as it tastes great, you can call it chili if you want to! This super easy dish cooks in one pot in less than 30 minutes. It’s the perfect weeknight meal and does just as well for entertaining. Sweet potatoes can be peeled and cubed ahead of time and stored in the refrigerator until ready to use. Freeze leftovers or extra batches in tightly-sealing plastic bags or individual freezer containers. Add crumbled beef or turkey, if desired. Optional toppings: shredded cheese, avocado, sour cream. 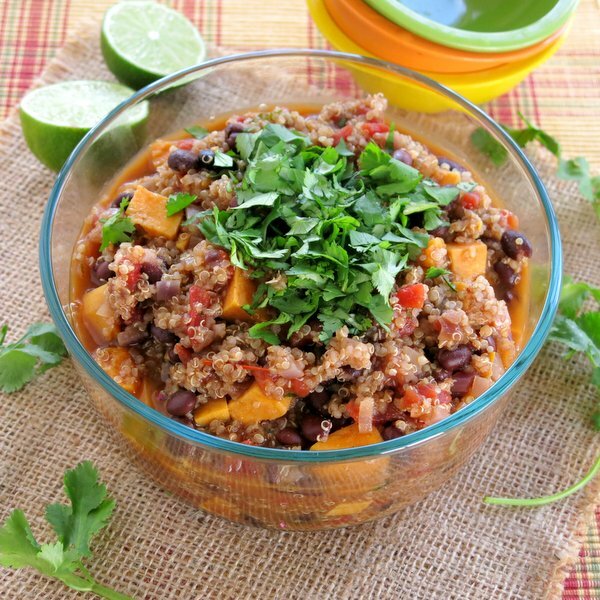 Check out some other chili variations we love! 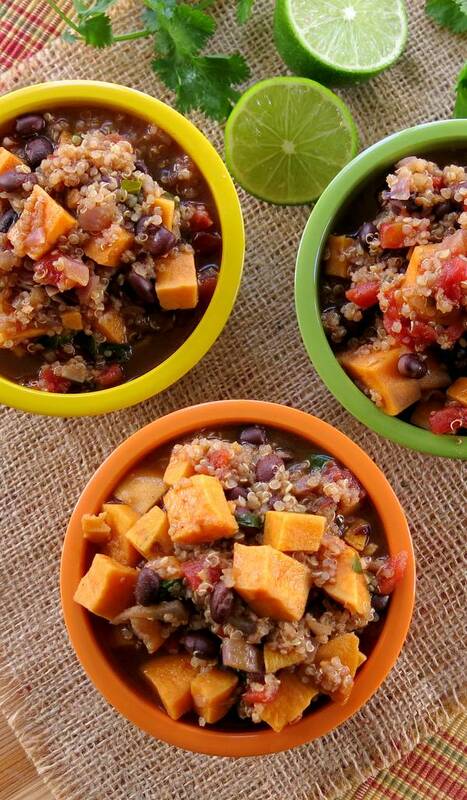 Sweet Potato Black Bean Chili with Quinoa is a hearty, meatless recipe that will even satisfy the carnivores in your house. Place olive oil in large pot and heat over medium high heat. Add sweet potato and onion to pot and saute for about 5 minutes. Add garlic and cook for about a minute more. Add remaining ingredients, except for cilantro and lime juice, to pot. 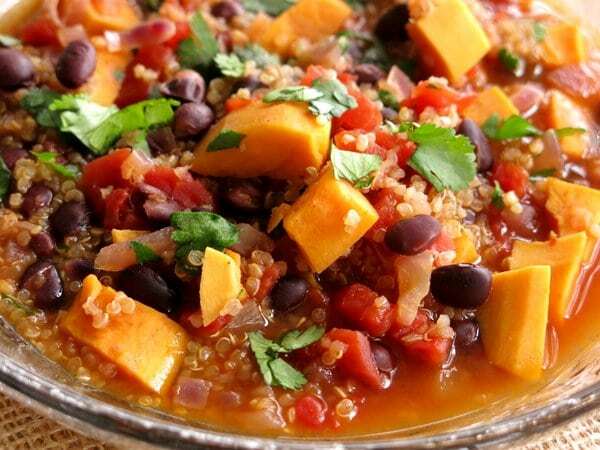 Bring to a boil, then reduce to simmer and cook for about 20 minutes or until the sweet potatoes are fork tender and the quinoa is cooked. 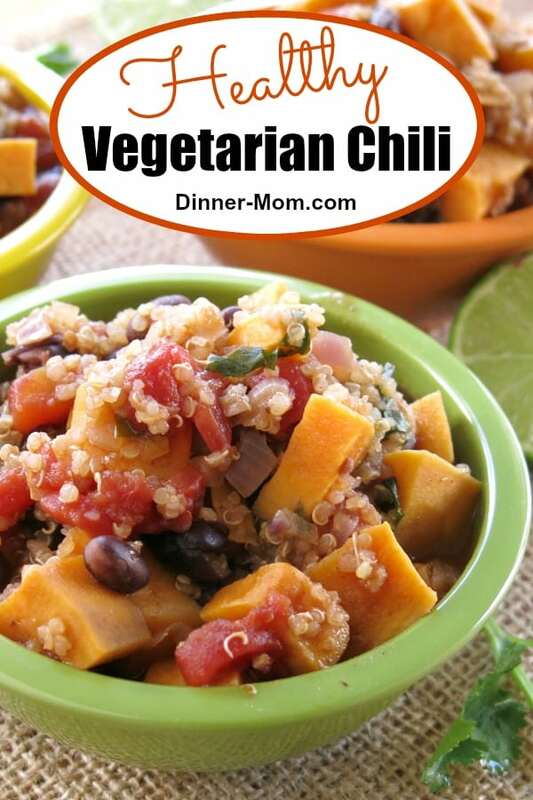 This looks like a perfect dinner for meatless monday! Girl, I’m with you. If you think it’s chili, then it’s chili. Now to convince my husband to eat quinoa…. 🙂 I need to know your tricks! The colors in this are so vibrant and I love the quinoa in it! How fun that National Chili Day is my brothers birthday! 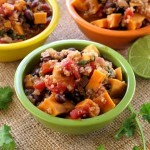 I will have to tell him that 😉 And this sweet potato and black bean chili is right up our alley! I love the colors. I love chili all day every day. This version looks fabulous! I’m not really into the chili debate. I love it with beans, and without. I also love your version with the quinoa. Looks so, so good! Hey! Chilli con Carne is my favorite Mexican dish. But I will try this amazing vegetarian meal! A lot of chilli powder is never a mistake. Thanks for sharing! Great chili!! Made it tonight for my daughter’s family and everyone ate it including the kids. This was amazing! I was worried for a while that it was too much broth, but in the last few minutes the quinoa soaked most of it up. Definitely making again. Quick, easy, and healthy! I’m so glad you enjoyed it! Thanks for your feedback!!! The diced tomatoes I had on hand already had garlic and lime juice added. The canned Cuban black beans that I used already had cumin added. Bonus! Nice!!! I’m glad you enjoyed it! Can you substitute butternut squash for the sweet potatoes? My husband is not a fan of sweet potatoes. Thanks!